Exclusive stall-sensing circuitry eliminates problems associated with valve/actuator misalignment. Power to the actuator motor is switched off when the driver pin goes against the stop of the valve cutout - no sooner, no later - and it's all done without any mechanical microswitches. 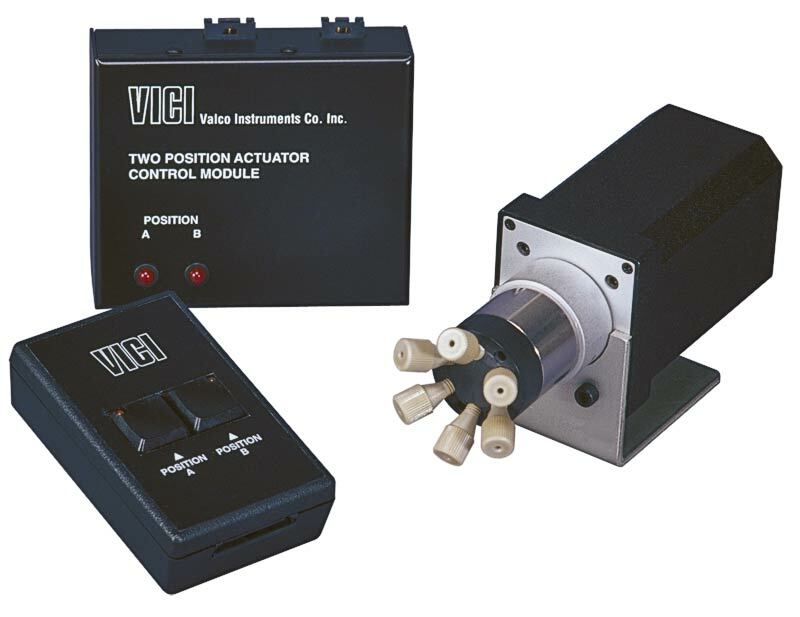 Not only are alignment problems are a thing of the past, you can stock one actuator model for valves that turn 30°, 36°, 45°, 60°, 90°, or anything in between. During initialization, the valve rotates at moderate speed while the actuator waits to sense the stall. Once the rotation angle has been measured and confirmed by repetition, the angle is memorized and actuation takes place at maximum speed. Valve position memory is maintained even in the event of a power failure. Some valves are harder or easier than others to rotate, so we offer five microelectric models with a range of torque specs. As the figure at right illustrates, actuator speed and torque are inversely proportional. WHICH MODEL DO I NEED? Standard voltage 24 VDC. Autosensing 24 VDC power supply is included. An RS-232 cable is required for controlling an actuator from a computer serial port. Multi-drop cables permit a single serial port to control multiple microelectric two position and multiposition actuators. Multi-drop cables have one female DB9 connector and 2 to 8 male DB9 connectors and are approximately 6" long. Note: An RS-232 interface cable (I-22697) is required for each actuator controlled serially. Plug-and-play cables will allow a direct connection and control between a specific instrument and a two position microelectric actuator. Contact technical support for cables for other instruments. Which actuator model do I need for the valve I have? Multi-drop cables permit a single serial port (RS-232) to control multiple actuators.